Every case calls for a detailed study of the patient individually. There are no disease-specific medicines in homeopathy. The exact treatment is determined only by "in-depth" evaluation of the individual case. The medicines described below are commonly indicated in Ankylosing Spondylitis, only for the purpose of information. The readers are advised not to indulge in any kind of self-medication. There are over 50 medicines, out of which the patient of AS might require one. It is a complex process of determining the right remedy. This medicine is prepared from potassium salt K2CO3. It is a broad spectrum remedy useful for a range of deep-seated diseases including but not limited to, Ankylosing Arthritis, Psoriatic arthritis, anxiety neurosis, asthma, sleeplessness, psoriasis, etc. It may be noted that the remedy is not indicated on the basis of the name of the disease. The patient requiting Kali carbonicum may present with back pain with tremendous weakness. The weakness of the body, of the fibrous tissues, of the mind, of any part of the body. The patient may be sensitive to cold, cold air, cold bath, etc. The associated features may be abnormal anxiety, irritability towards loved ones, weeping tendency, sensitivity. The back pain may be described by this patient as "stitching pain". It may be dull aching with stiffness, with difficult mobility. There are many other symptoms which relate to the genetic and immunological connections. This medicine is deep acting and should not be taken without professional observation. Rhus Toxicodendron is another common remedy used for Ankylosing spondylitis and conditions related to joint and fibrous tissues. It is prepared from a plant commonly known as Poison ivy. The leaves and the bark of the plant contain a very poisonous resinous substance, which has an allergic effect. This drug positively affects multiple systems of the body including skin, joints, extremities, eyes, mucous membranes, and the general vitality. Rhus tox is a good remedy for disorders that result from or get aggravated from getting wet or from exposure to excess cold. Characterized by the severe burning of the affected part, inflamed rash with excessive sensitivity to cold. The stiffness of back associated with restlessness form key indication for This remedy. Usually, this remedy is superficial and one requires support from more deeper acting medicine for conditions such as AS. Natrum Muriaticum is an interesting example of homeopathic medicine prepared from a common food substance, the common salt, NaCl, sodium chloride. As a rule, the common salt undergoes a special medicine preparation process called potentization, whereby its inner healing power is activated to make available for the healing process. Natrum Muriaticum is almost 200 years old, one of the most commonly used medicines in homeopathy, introduced by the founder of homeopathy Dr. Samuel Hahnemann, MD. Constitutionally, this medicine has a broad spectrum of action, useful for a wide range of disease processes, affecting the skin, gastrointestinal organs, nose, lungs, kidney, metabolism, muscles, head, hormonal system, etc. It is one of the commonly used remedies for migraine, Rheumatoid arthritis, Ankylosing spondylitis, urticaria, eczema, lichen planus, Vitiligo, asthma, etc. Usually reserved or introvert, less communicative about personal matters. Less social. Sadness is not easily expressed. Emotional and sensitive. Weeping alone does not desire sympathy. Sincere sympathy is appreciated, though. Does not like to be pitied. Grief, unexpressed. Sympathetic. Revengeful thoughts when hurt. It may be noted that the homeopathic medicines are largely broad-spectrum in action. That means the medicines are capable of inducing the healing process in any kind of diseases. Every patient requiring a particular remedy will not have all the indications of the remedy. Again, every remedy may not cover all the symptoms of the patient. The selection of the remedy is made by the attending physician when he or she looks at the case as a whole. Sulphur is one of the commonly indicated homeopathy medicines for a wide range of complaints. It is a truepolychrestt remedy having an influence on various systems of the body like nerves, digestive system, skin, joints, urinary system, respiratory system, reproductive organs, etc. It is one of the frequently prescribed remedies for AS during different stages of the disease. The thermal sensitivity of this patient is that of intolerance to heat. The desire for eating sweets in any form, tendency to have skin disease or history of suppressed skin disease in the past, before developing AS, could be observed ins some patients. The sensation of heat in the affected parts is also a key indication. This medicine is very strong in action. Only a few doses, that too, under the professional care, may need to be administered. Self-prescribing could be harmful. This is a drug prepared from a plant Thuja occidentalis commonly known as Arbor Vitae. This is a deep acting remedy with a wide sphere of action. It is a constitutional remedy, of great use in many disease processes. It has a profound action on respiratory organs, joints, back, skin, genito-urinary organs, nervous system, glands, kidneys, blood, etc. Its one of the frequently indicated remedies for Ankylosing spondylitis during a certain stage. The tendency to have unhealthy skin in general. It is a good drug not only for physical complaints but also for the affection of the mind. For example, it can be very useful in psychotic states, anxiety disorders, depression, etc. It is the beauty of homeopathy that it can use a wide range of natural sources ranging from plants and their products, minerals and compounds, and even animal products for its medicines. Sepia is one such example of medicine prepared from inky juice of Cuttle fish. The latent medicinal power of this juice is aroused by means of homeopathic potentization. Sepia is one of the greatest contributions made to Homeopathy Materia Medica by the founder of homeopathy, Dr. Hahnemann. So it goes without saying that this medicine is as old as homeopathy itself and is one of the favorite medicines of Homeopaths world-over. Before elaborating the indications of this remedy I would like to share with you its birth-story. Dr. Hahnemann got the clue to initiate proving of this remedy from a patient, who was an artist and had a regular habit of wetting his brush containing Indian ink with his own saliva. Every time he did so, a very small portion of the ink would naturally find its way into the stomach to be absorbed by the system. By and by, he developed certain chronic ailments. Hahnemann treated him with all the known similimums to his best of skills and ability but without any appreciable benefit. Excepting that his habit of wetting his brush with his own saliva and consequent affection of the ink, would have been the maintaining cause, the artist was advised to discontinue his profession. The artist obeyed him and he was completely redeemed of all his chronic ailments. This unique pleasant experience ultimately led Dr. Hahnemann to prove sepia for the benefit of generations of mankind. Sepia positively influences female genital organs, digestive system, liver, skin, glands, lungs, and nerves. It is one of the mot commonly used medicines for Arthritis of all types (rheumatoid arthritis, ankylosing spondylitis, osteoarthritis, etc.) 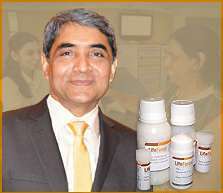 herpes, eczema, urticaria, lichen planus, ring worm, vitiligo, hair fall, styes and chalazion, asthma, urinary tract infection. It is one of the best medicines for all possible gynecological and pregnancy related complaints. Sepia is indicated for individuals who feel a lack of interest and concern about their family members and friends, whom they loved once best. This stage comes from their mental or physical overexertion and fatigue. They usually have a sad, depressed mood. Even while narrating their complaints they tend to weep. However, they feel annoyed when somebody consoles and sympathizes with them. They don't like much of the company and feel irritated about small affairs. They cannot bear disagreement with their opinion and decision. They feel mentally tired and do not feel like working. They are anxious individuals, constantly worrying about their health and imaginary problems. It may be noted that the homeopathic medicines are largely broad spectrum. That means the medicines are capable of inducing the healing process in any kind of diseases. Every patient requiring a particular remedy will not have all the indications of the remedy. Again, every remedy will not have all the symptoms of the patient. The attending physician makes the selection of the remedy when he or she looks at the case as a whole. Silica positively influences bones and joints, mucous membranes, skin, cellular tissue, nerves, glands, lungs, digestive system, etc. Silica is one of the frequently used medicines for complaints of asthmatic bronchitis, joint diseases, vitiligo, eczema, lichen planus, herpes, urticaria, pneumonia, tuberculosis, styes and chalazion, trigeminal neuralgia, complaints of nails, tonsillitis, etc. Patients requiring silica usually have a tendency to easy suppuration of skin injuries. Silica positively influences nutrition as well and hence its one of the prominent remedies used for rickets in children.